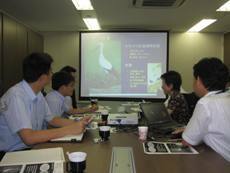 On July 8 (Wed.), 2009, a group of practical engineers from the Water Resources Agency, Ministry of Economic Affairs, Government of Taiwan (Chinese Taipei), came to Japan to participate in a training program which gives information on efforts for river environment improvement in Japan, which was conducted by the JRRN Secretariat and the Foundation for Riverfront Improvement and Restoration. In Taiwan, projects for river environment restoration have recently been carried out throughout the country, including the recent release of a website covering information on river restoration by a public agency. 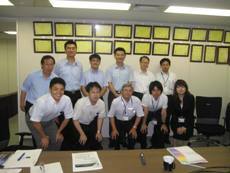 Therefore, we think that the above training program was a good opportunity to learn about the latest Japanese measures, etc., in the field of river environment, including nature-oriented river management and nature restoration projects.